You save private data on an extra drive that is supposed to be kept away from nosy people. The optional password protection that you can install is however not sufficient as a security measure. You can make certain drives invisible. This will still allow you to access them, but these volumes are absolutely not visible in Explorer. This can be done via Windows tools via a registry entry. For that, enter ‘regedit’ in the search field of the Start menu and press the [Enter] key. Confirm the user account control question with ‘Yes’ or ‘Next’. Navigate to the key ‘HKEY_CURRENT_USER\Software\Microsoft\Windows\CurrentVersion\Policies\Explorer’. Then click in the right part of the dialog and generate the entry ‘NoDrives’ with the command ‘Edit | New | DWORD-value’. Then open this entry for editing by double clicking. The value required now depends on which drive or drives you want to hide. This basically functions as per a bit pattern, wherein every bit stands for a drive starting with ‘A:’. To hide a specific drive, first determine which letter of the alphabet the drive name is. For the ‘H:’ drive, it is the eighth letter. As the value, you will now require the eighth bit, which decimally corresponds to the value 2(8-1) = 128. You can thus determine a corresponding value for every drive. To hide multiple drives, add all individual values. For example, if you want to hide the B, H and J drives, you will need the following values: 2(2-1)=2, 2(8-1)=128 and 2(10-1)=512. These add up to 642. For that, activate the ‘Decimal’ option in the dialog for ‘Base’ and then enter the calculated value. Confirm your entries with ‘OK’ and close the registry. The drives will no longer be visible when you start Windows Explorer next. Note: Hiding the drives does not have any effect on the ability of programs to access them. 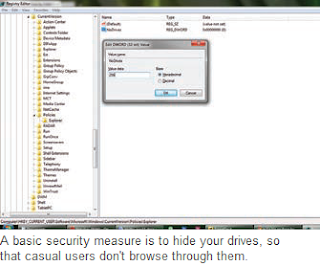 Moreover, it will still be possible to access the hidden drives by directly entering the relevant drive letter in the address bar in Windows Explorer.